There are currently several different associations dedicated to practicing Goya-Ra-Ru Marital Arts throughout the country. 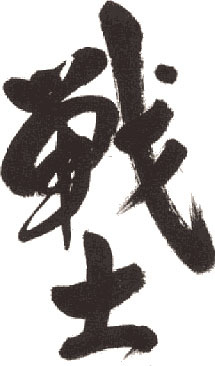 The core values, techniques and kata are very similar, although each group has its own identity. The different associations are generally distinguished by geography, our group being based in the West Midlands for example. Our group is known as the Bushi Goya-Ra-Ru Association. Bushi (pronounced boo-she) is another name for Samurai (warrior). Goya-Ra-Ru is of course the style of martial art practiced at our clubs. "journey towards excellence through physical training"
"path to the mind via the physical body"
- the classic interpretation of "Goya-Ra-Ru". The crescents represent the "journey" or "path", circular flowing movement, and link the symbols in order. The standard colours as they appear on the Goya-Ra-Ru suit badge are black, white and red.